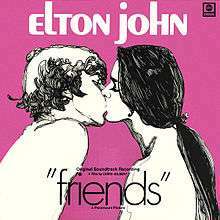 Friends, released in 1971, was the fourth official album release for Elton John. It was a project John and Bernie Taupin took on before their breakout success in the US, based on the Friends film released in the same year. It was certified gold in April 1971 by the RIAA. It became John's third gold record in as many months in that market (following the albums Elton John in February and Tumbleweed Connection in March). The title track was a minor hit in the US (#34 on the pop chart) despite the film's poor performance. The rights to the soundtrack are now with Universal Music Group, which shares ownership of John's music with him, and which also owns the Paramount Records catalogue. The Friends soundtrack is also available on the Rare Masters (1992) 2-CD set, tracks 10-19 on Disc One, albeit with the tracks in a different order to the original LP. The difference is that "Michelle's Song" changes places with "Honey Roll" and "Variations on Friends". In the early 1970s, John performed the title track and "Can I Put You On" in concert, with the latter appearing on the next release, the live recording 17-11-70 (entitled 11-17-70 in North America). The most recent performance of "Friends" was in 1999. All songs by Elton John and Bernie Taupin, except where noted. Timings are on the LP release, while those in parentheses are those for the Rare Masters collection. ↑ "Elton John's Gold & Platinum Albums". Neosoul.com. 2000-08-28. Retrieved 2012-02-16.